One of the most influential, in-depth Records of our time. This Album pushes the boundaries of Hip-Hop into the next universe. I can not describe how much I praise this Album. It has changed my view of Hip-Hop music forever. The Production alone has been hailed by many, if not all, who have heard it. This is just one of those Records that people will be talking about for the rest of time. Please, Bless Your Ears. 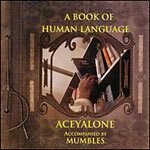 All Lyrics by Acey The Face Man. All Beats by The Producer Mumbles.